Possible to convert SR5 rear axles to use disc brakes? Re: Possible to convert SR5 rear axles to use disc brakes? I am trying to do the same here in Okinawa. I have done some research and have seen write ups saying that the Toyota Surf and Nissan Primera rear ends are the same size and will work. I understand these models are not the same in the US but maybe they have a different name? If you look around online, there are a couple threads about converting Toyotas to use AE86 rear disc brakes. I think most, if not all, of these threads are on doing the process to old Celicas. Are there any disc brake setups that will bolt to this pattern? No, not without mods. Well, I've heard that in Europe there's a drum-in-hat disc brake setup off a Corona or something, but here in the USA we're stuck. Dr. Occa had a write-up in 86 Garage Magazine that used brackets and Wilwood calipers from Hawk Machine, but that won't give you an e-brake, and the calipers are expensive. In my 4AC Powered thread, I wasn't able to find a setup that would clear the SR5 axle hat and fit under my 13" rims. If you find the Celica threads you'll notice they have to get the axle hats (idk the proper name) machined down to fit. Other things to consider are threading the hard brake lines into the new calipers, and that you'll probably have to upgrade your proportioning valve (or get an adjustable one). Either way, it seems like you'll need to get some machine work done and get custom brackets made up, but yes, it can be done, although it will probably take more work than swapping in a GTS rear end. I sorta skimmed through this thread so forgive me if what I said is already covered. But based on my gts axle that I plan to rebuild here is what I noticed. I personally think that you can convert an sr5 rear end with disk brakes. All you would need is the dusk shield from the gts which has a built in bracket for the brake caliper to mount onto. Take off drum housing and place the dusk shield in place mount rotors and brake calipers on the solid axle. Now some of you might say SR5 axle is different from the GTS. But I found out that only in the Zenki both gts and sr5 axles are the same. According to ToyotaPartsOverstock they even share the same part# which leads me to believe that both axle is exactly the same when you look at the exploded diagram view. Now for the lines bend the lines out of the way and buy some universal steel braided lines. I know many of you might not understand AN fittings as well so I will try my best to explain what look for. Find a universal steel braid line that has -3 female on both ends. Most of those lines should come -3 females on each ends by default. On the hardline side get an adapter that is Female 10m x 1.0 to a male -3 male fitting and screw that into the hardline fitting. On the brake caliper side get another adapter that is Male 10m x 1.0 to a male -3 fitting and screw that straight into the hole that the stock lines should screw into. Plug the universal steel braided line into the -3 end of both adapters to complete the line. Then do the same for the other side. If anyone still has questions about it the lines this company called Hillco Fastener Warehouse sells all the fittings if you can't find where to find the lines. any update? or more on the pdf ofnthe magazine? thank you! Hey guys, sorry to dig up such an ancient thread, but I need help. I bought a sr5 for dirt cheap. It has the 4AC that I am planning to replace with a nissan KA24DE that I am taking from my drift car. I plan to turn the '86 into a drift car for my wife. The main issue is the drum brakes. Since the car will be purpose built for drifting, I would need to utilize a disc brake setup. I have tried looking into the Hawk stuff. Nothing conclusive on that end. I have been coming across this thread for a while now. I tried finding the 86Garage magazine. No such luck. I am in need of a copy, or even a PDF scan of the issue. I have paypal ready and am willing to pay. Morgan, please help. My wife and I both are registered to drift in the upcoming June event. Since I am gutting the power train from my S14, we will both be drifting the Corolla. It is imperative that my wife and I finish this build. Thank you guys in advance. Hey, man. Welcome to the forum! 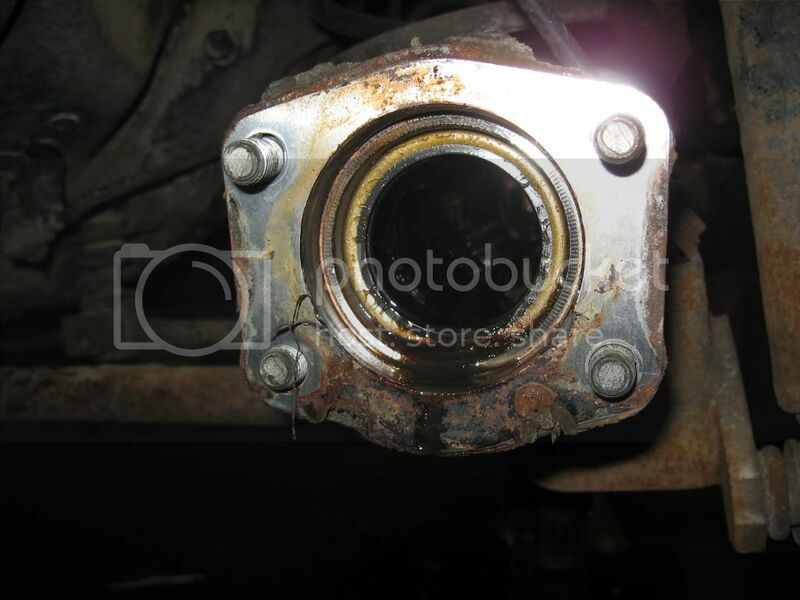 Seeing as you will be swapping the powertrain, you might as well go and buy a new rear end. You can get a shop to make a one-piece driveshaft (Google it) for you and use the rear end that I mentioned beforehand. Good luck with the swap and have fun skidding! Location: Colorado Springs, CO U.S.A. So, I'm going to resurrect the dead again because I wanted to make mention to anyone looking for the conversion write up from 86 magazine, that it is available on Amazon.com. I also wanted to reach out to anyone that's done this swap as I am close to completing it. I've got all of the pieces and parts, but am unsure what to do with my excess brake line? It's not specified in the article whether or not they were shortened or just bent to fit? Hey guys, any chance one of you could forward the pdf to me? Finally almost finished with my FX16 and planning my SR5 rebuild. I'd love to ditch my rear drum mess, even though finding a full lsd swap is unlikely. I have broken several SR5 rear ends. I have a set of SR5 axles and a third member with 3.90 gears if you ever need them.